It’s afghan season so let’s get stitchin’ on something cozy for curling up with on those chilly Autumn evenings! Here is a contemporary twist on a classic crochet ripple afghan pattern. Here I used V-stitches to created a more lacy, open design to the traditional ripple. One of my favorite things about ripple afghans is the opportunity to use color! But don’t let color changes intimidate you with this pattern. The colors are carried up the sides of the afghan so there is no need to fasten off and rejoin for each color change. I’m all about keeping things simple! Finished crochet ripple afghan pattern measures approximately 50 in. × 64 in. The size of the blanket can be easily customized by changing the length of the beginning chain. Chain a multiple of 26 + 4 stitches. Do not fasten off at the end of each row; carry colors along side of blanket. V-stitch (V-st): double crochet, chain 1, double crochet. Counts as 1 stitch in end of row counts. Row 1: Work 1 dc in 4th ch from hook (counts as dc2tog), +skip next 2 ch, *work a V-st in next ch, skip next 2 ch,** rep from * to ** twice more, [V-st, ch 1, V-st] in next chain, skip next 2 ch, work from * to ** three times, work dc2tog in the 3rd and 5th ch, ++ rep from + to ++ across, drop CA turn — 64 sts. Row 2: Join CB, ch 2, work 1 dc in ch-1 sp of next V-st (counts as dc2tog), *work 1 V-st in the ch-1 sps of next 3 V-sts, [V-st, ch 1, V-st] in next ch-1 sp, work 1 V-st in the ch-1 sps of next 3 V-sts, work dc2tog over next 2 ch-1 sps, rep from * across working last dc2tog of row over the ch-1sp of last V-st and the last dc, turn, drop CB — 64 sts. Row 3: Join CC, ch 2, work 1 dc in ch-1 sp of next V-st (counts as dc2tog), *work 1 V-st in the ch-1 sps of next 3 V-sts, [V-st, ch 1, V-st] in next ch-1 sp, work 1 V-st in the ch-1 sps of next 3 V-sts, work dc2tog over the ch-1 sps of next 2 V-sts, rep from * across working last dc2tog of row over the ch-1sp of last V-st and the last dc, turn, drop CC — 64 sts. Row 4: Join CD, ch 2, work 1 dc in ch-1 sp of next V-st (counts as dc2tog), *work 1 V-st in the ch-1 sps of next 3 V-sts, [V-st, ch 1, V-st] in next ch-1 sp, work 1 V-st in the ch-1 sps of next 3 V-sts, work dc2tog over the ch-1 sps of next 2 V-sts, rep from * across working last dc2tog of row over the ch-1sp of last V-st and the last dc, turn, drop CD — 64 sts. Row 5: Join CE, ch 2, work 1 dc in ch-1 sp of next V-st (counts as dc2tog), *work 1 V-st in the ch-1 sps of next 3 V-sts, [V-st, ch 1, V-st] in next ch-1 sp, work 1 V-st in the ch-1 sps of next 3 V-sts, work dc2tog over the ch-1 sps of next 2 V-sts, rep from * across working last dc2tog of row over the ch-1sp of last V-st and the last dc, turn, drop CE — 64 sts. Row 6: Join CA, ch 2, work 1 dc in ch-1 sp of next V-st (counts as dc2tog), *work 1 V-st in the ch-1 sps of next 3 V-sts, [V-st, ch 1, V-st] in next ch-1 sp, work 1 V-st in the ch-1 sps of next 3 V-sts, work dc2tog over the ch-1 sps of next 2 V-sts, rep from * across working last dc2tog of row over the ch-1sp of last V-st and the last dc, turn, drop CA — 64 sts. Rows 7 through 51: Rep rows 2 through 6. Round 1: Join CB in 1st dc of Row 52, ch 1 (does not count as st), work 2 sc in same st as join, work 1 sc in each dc and ch-sp of the next 4 V-sts, work 3 scs in next ch-1 sp, work 1 sc in each dc and ch-sp of the next 3 V-sts, work 1 sc in first dc and the ch-1 sp of next V-st, *work sc3tog over next 3 sts, work 1 sc in the ch-1 sp and last dc and of next V-st, work 1 sc in each dc and ch-sp of the next 3 V-sts, work 3 scs in next ch-1 sp, work 1 sc in each dc and ch-sp of the next 3 V-sts, work 1 sc in first dc and the ch-1 sp of next V-st, rep from * across row, work 1 sc in last dc of last V-st, work 2 sc in last st. Working along the side, work evenly spaced single crochets along edge of rows. Working along beginning edge, work 3 scs in first ch, 1 sc in each of the next 12 ch, sc3tog, 1 sc in each of the next 11 ch, **3 sc in next ch, 1 sc in each of the next 11 ch, sc3tog, 1 sc in each of the next 11 ch, rep from ** across, work 1 sc in next ch, 2 sc in last ch. Working back along next side, work evenly spaced single crochets along edge of rows equal to the number you worked along the opposite side. Join in 1st st of round. Fasten off. Round 2: Work in the back loop of all stitches of round. Join CC in the back loop of the 2nd st of Round 1, ch 1 (does not count as st), work 2 sc in same st as join, work 1 sc in next 13 sts, work 3 sc in next st, work 1 sc in next 11 sts, *sc3tog, work 1 sc in next 11 sts, work 3 sc in next st, work 1 sc in next 11 sts, rep from * across, work 1 sc in last next st, work 2 sc in last st. Work 1 sc in each st along side edge. Working along beginning edge, work 2 sc in 1st st, work 1 sc in next 12 sts, sc3tog, work 1 sc in next 11 sts, work 3 sc in next st, **work 1 sc in next 11 sts, sc3tog, work 1 sc in next 11 sts, rep from ** across, work 1 sc in next st, 2 sc in last st. Work 1 sc in each st along side edge. Join in 1st st of round. Fasten off. Weave in ends. Block blanket if desired to shape. 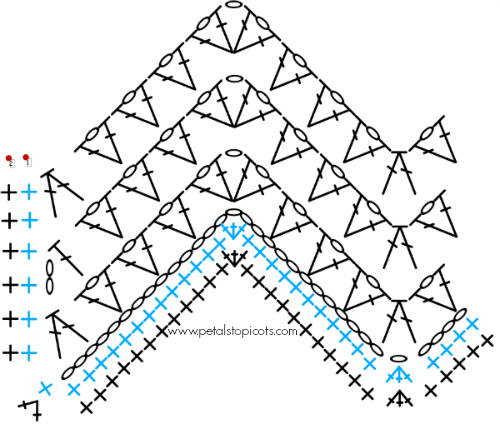 Did anyone ever get the end of the pattern figured out. I so wanted to crochet this afghan, however; the end of the row just doesn’t come out right. I get the last 3 V-stitches, but when I do the 2dctog it just doesn’t look right…..too right. Any news on a video? I’ve gotten to the end of my first row and it looks like it ends with only two V stitches after a decrease, is this correct? Having trouble with your instruction at the end of the first row. I’ve got my 3 v stitches made, then it says to do a 2dctog, but it doesn’t look right, can u help please? Cara- I noticed several people have asked if there is a video tutorial for this pattern but I don’t see any replies to their request. Is there an instructional video? Unfortunately I do not have a video for this right now although I do hope to make one at some point. Thanks Kara! If I get stuck with a question can I reach out to you on here? Or would there be another (better) way to get a question answered? No, you do multiples of 26 (26, 52, 78 etc,) then add 4 so it would be 30 or 56, or 82. hope that makes sense. If you have never done multiples it can be confusing. Like everyone else I LOVE the color combination. I woud never have thought that they would be so lovely together. Thank you for sharing. What yarn is this? Is there a difference in chunky and bulky? Hi Anne 🙂 I used Knit Picks Brava Bulky yarn for this project. Sometimes bulky and chunky are used interchangeably, so just make sure the label is weight #5 for this project. Do you have a video tutorial for this stitch. I work better watching someone else and doing it with them. 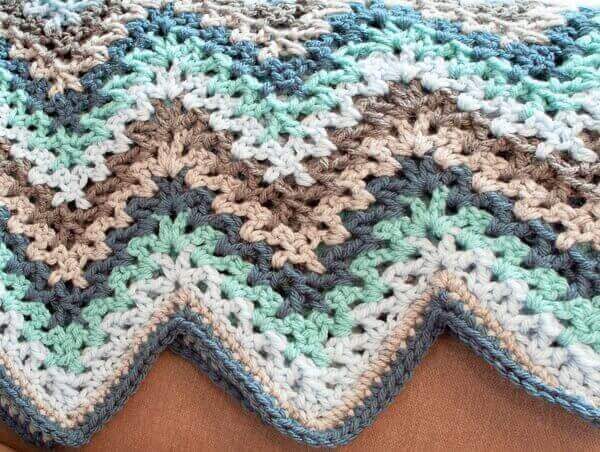 Hi I want to crochet a similar pattern but struggling with both I can’t seem to undestand the space gap where skip 2 chains dcdec chn 1 dcdec v stch. So if this is correct on 2nd row where do the v stchs go into spaces of skip 2 chns or ontop of the foundation v stchs? I’ve been frogging this afghan do to pattern not looking correct for some reason. Any help its appreciated. I loved using your pattern!!! Thank you so much! I want to straighten the ‘pointed’ edge …… Do you perhaps have any ideas on how to do this? I am so glad you liked it Christa 🙂 I don’t have a pattern already written up for how to do that for this, but you may be able to google and see if others might. I love this pattern!! I just got started a couple of days ago and so far so good! Thanks for sharing the “recipe” (as my mother-in-law calls it)!! I LOVE this pattern, but seem to be having difficulty understanding the directions – my fault – not yours! Is there a video tutorial, I can’t seem to find one – do you know of any? Love this! Do you have trouble with your tails staying tucked? I made a baby blanket using the V stitch. I love it, but my tails keep popping out. I tie and then tuck my tails. 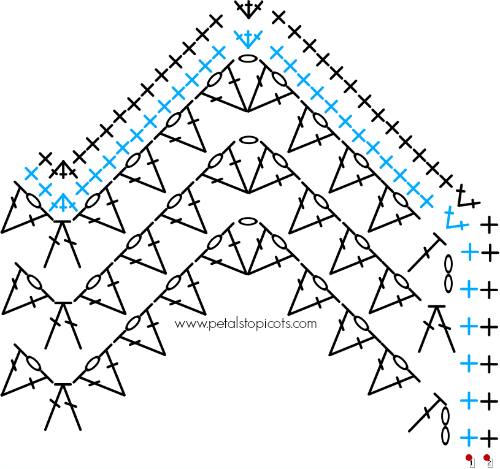 I would love to try this pattern, but am afraid I would have the same problem. Any tips? Have you tried sewing them into stitches of the same color? I used to just crochet over the tails until I got a large (and blunt) needle to sew them in. The trick is to follow the friction of the yarn in each stitch, to go in multiple directions, and make sure to end the sewing at a tight spot in the stitches. I hope this helps! Have you tried sewing them into stitches of the same color? I used to just crochet over the tails until I got a large (and blunt) needle to sew them in. The trick is to follow the direction of the yarn in each stitch, to go in multiple directions, and make sure to end the sewing at a tight spot in the stitches. I hope this helps! As long as you you have the appropriate size of hook, it will work just fine; however the smaller weighted the yarn is, the more it takes to get to the same length. Which colors or which brands did you use? I ALWAYS Have trouble with color selections. I hope you don’t mind?!?! I am making the v-stitch crochet ripple afghan and am having a hard time getting the end straight. It is veering inward. Is that how it should happen? Hi Jan 🙂 Are you certain you aren’t missing stitches at the beginning or the end of the rows? no I am not sure some times I get to stitching and don’t pay attention to where I am at so I will go back and count the three rows I have done. Thanks for your reply. I will get back to you and let you know if that was it. I also add more to the chain to make it wider and it was the right amount of chains so I was proud of myself for that part. I’m 4 rows in and the patterns seems to be doing a wavy look to it and not a dramatic V as I was hoping for as seen on the photos you’ve provided. Can you help me please. Will it work it’s way as I work along? When I block it is that when this effect happens? I am sorry you are having trouble. Sometimes it does take quite a few rows to see how a pattern is coming out. When you lay it out flat are you see a ripple effect at all? So lovely. This pattern is a wonderful tribute to all the afghans I remember my grandmother making. Thank you for the pattern! 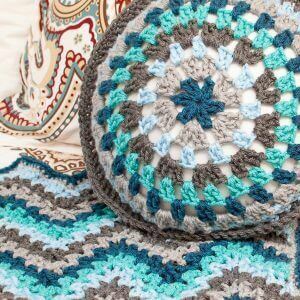 I’m tired of granny square blankets, and this looks like a good new project! Kara, the colors you selected for your afghan are absolutely stunning! You have a wonderful eye for color and design! What colors are used on the V-Stitch Ripple Afghan? Those colors look amazing together!!! would you be interested in selling this quilt ?? I love this blanket and the colors are beautiful! Thanks so much for all you do! What a lovely blanket, I love the colours you have chosen, they work really well together, I always struggle with that part of blanket making! Would you mind me asking what yarn you used and what colours too please? I just love the colors u choose. Could u tell me what colors they r. I am awful with colors. Thank u so much. As shown in the photo at the top, the colors used from the bottom row up are Sky, Cornflower, Peacock, Dove Heather, Cobblestone. Hope that helps! Love, love, love the color scheme! Ripple afghans always fill me with good memories. My grandmother’s home was never without one for each chair, sofa and bed. Thanks for sharing!